"These are very yummy, and if any of you have ever had Japanese tempura coated veggies, you'll love this recipe. It's similar, yet it is unique in it's taste. Serve with a chili sauce, mint yogurt sauce, or sweet and sour sauce. Try other vegetables for dipping, such as sweet potatoes, broccoli and asparagus." Make a well in the center of the flower. Gradually pour the water into the well and mix to form a thick, smooth batter. Over medium high heat in a large, heavy saucepan, heat the oil to 375 degrees F (190 degrees C). Coat the cauliflower and onions in the batter and fry them in small batches until golden brown, about 4 to 5 minutes. Drain on paper towels before serving. 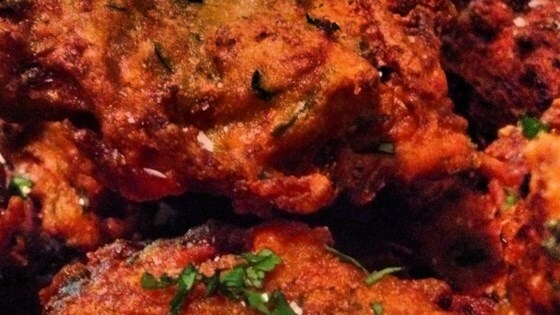 I have always loved Pakora's. They are my favorite indian appetizer and these were fabulous. I have never made these before and now I may never order them at a restaurant again.